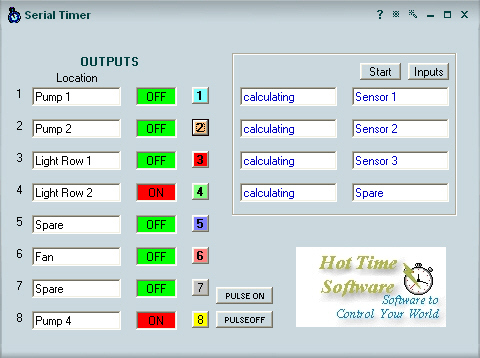 Timer(Multiple Switchings) is the perfect timing software to control hydroponics, relays, solenoids or lights from a computers printer port. This program enables the PC to connect to the outside world by using the printer port LPT1. Hardware can then be connected to the computer to control hydroponics, security lights, gardening and home automation using solenoids, relays and sensors. Being user friendly this application puts the user in a powerful position of operating devices set by time and day, with On, Off or Auto modes. A click of the mouse and your sprinklers can be watering, turn a light on, the options are endless. This modified file is the same as the original Timer program but has an additional pulse timer in minutes for each output and all outputs (channels) can have up to 10 switching times within the 24hr period from 00:00:00 to 23:59:59. For Domestic, Commercial or Industrial use. Has also Master control on Main form. Access to port 378 or LPT1 only. Works on Win95, 98, ME, 2000, NT, XP and 32 bit Vista. May not work on some Win95 machines, needs more than 16mb ram and 486 processor. 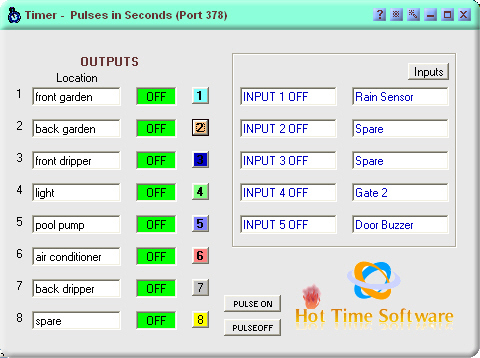 TIMER (pulses in minutes) is the perfect timing software to control hydroponics, relays, solenoids or lights from a computers printer port. This program enables the PC to connect to the outside world by using the printer port LPT1. Hardware can then be connected to the computer to control hydroponics, security lights, gardening and home automation using solenoids, relays and sensors. Being user friendly this application puts the user in a powerful position of operating devices set by time and day, with On, Off or Auto modes. A click of the mouse and your sprinklers can be watering, turn a light on, the options are endless. This modified file is the same as the original Timer program but has an additional pulse timer in minutes for each output. For Commercial or Industrial use. Has also Master control on Main form. Access to port 378 or LPT1 only. Works on Win95, 98, ME, 2000, NT, XP and 32 bit Vista. TIMER (pulses in seconds) is the perfect timing software to control hydroponics, relays, solenoids or lights from a computers printer port. This modified file is the same as the original Timer program but has an additional pulse timer in seconds for each output. For Commercial or Industrial use. Has also Master control on Main form. Access to port 378 or LPT1 only. Works on Win95, 98, ME, 2000, NT, XP and 32 bit Vista. 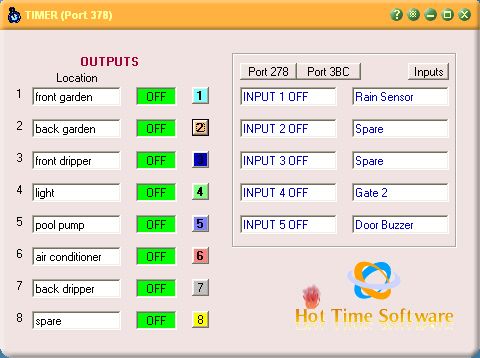 Timer is the perfect timing software to control hydroponics, relays, solenoids or lights from a computers printer port. 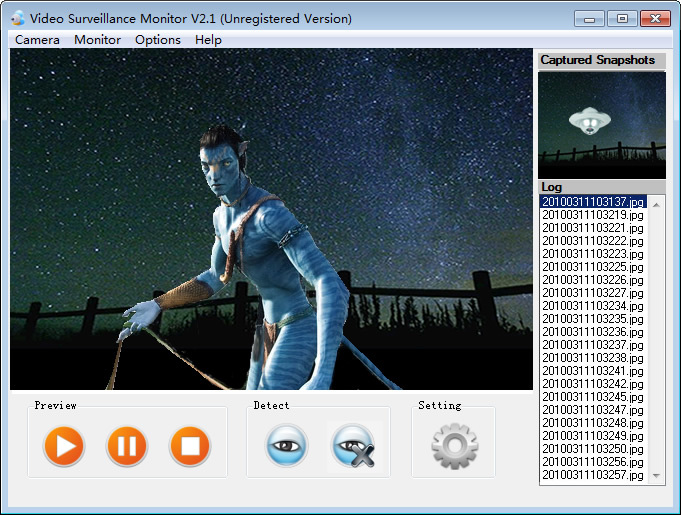 The unregistered version has limited functions. The registered version allows the user to control up to 24 channels via 3 printer ports. The trial version can also be downloaded from our website. For Win 95,98, XP, 2000, NT and 32 bit Vista. Use Dual Serial Timer to easily communicate with external appliances on an USB or RS232 connection. Dual Serial Timer has powerful features similar to the Timer software that work with all types of serial ports, including USB adaptors, Wireless Device Servers or any virtual port. This program is especially made to communicate with the Dual k108, 108 and k108 multi drop relay boards via serial connection. The program consists of 19 forms. A main form, 16 output forms, 1 input form and a settings form. The main form gives the status of all 16 outputs and 4 inputs. The location of each output and input can be altered on this form. Each output form can be selected by the push-buttons marked 1 to 16 or the inputs can be selected by the push-button Inputs. The main form can be minimized so that the user can do other tasks, and the timing program will still run in the background. 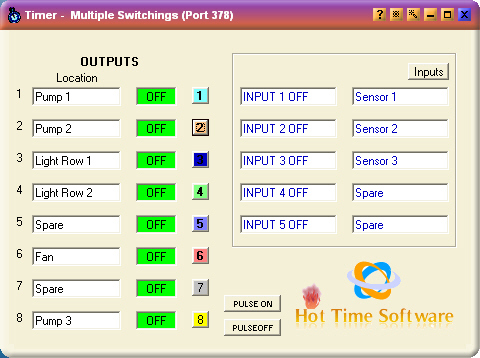 All outputs have an additional pulse timer from 1 second to 24 hours (set in minutes), on or off. The pulse will work regardless of the mode the form is in, ON, OFF or AUTO. For domestic, Commercial or Industrial use. Use Serial Timer to easily communicate with external appliances on an USB or RS232 connection. Serial Timer has powerful features similar to the Timer software that work with all types of serial ports, including USB adaptors, Wireless Device Servers or any virtual port. This program is especially made to communicate with the k108, 108 and k108 multi drop relay boards via serial connection. 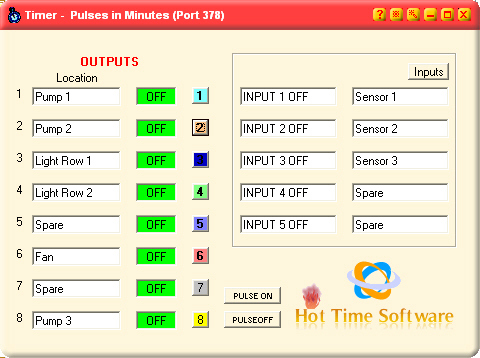 Same as the Timer program with additional pulse timer in minutes on each output form. Has also Master control on Main form. Access to serial com ports only. Works on Win 98, ME, 2000, NT, XP and 32 bit Vista. If connecting to USB, this software requires a USB to serial adaptor. This program, FAMILY DECISIONS, may be one of the most useful tools your family can have. Helps your family make those big family decisions (and it can help with the little decisions too). Provides an objective way to analyze something subjective. Identify and name the decision you need to make. Identify the alternatives (the possible choices). Determine your decision criteria (what factors will you take into consideration). Weight each criterion (how important is it to your decision). Using the criteria you have chosen, rate each of your chosen alternatives. FwFD calculates a weighted point rating for each alternative. FwFD picks the alternative with the highest value. FwFD produces a report that documents your decision. Start making better family decisions. Thermodynamical properties of water and water vapor and humid air. Main window: The program of calculation thermodynamical properties of water and water vapor allows to calculate p,t,v,h,s,x having 2 of p,t,v,h,s (p,t); (p,v); (p,h); (p,s); (t,v); as input parameters, excluding saturation curve, and two-faze zone where only (p,x); (t,x); (v,x); (s,x) pairs can be used as input. Additional window: Calculator of thermodynamical properties of the humid air. Units of pressure: Kg/sm2, Bar,KPa, mmHg; and energetical parameteres units Kcal/Kg, KJ/Kg. Important Note: you have to install the demo version before you try to get the full version key, this action allows you to get your “user id key” from the installed on your PC demo. Please, click to “Download free demo version” link to install demo if you did not do that already. 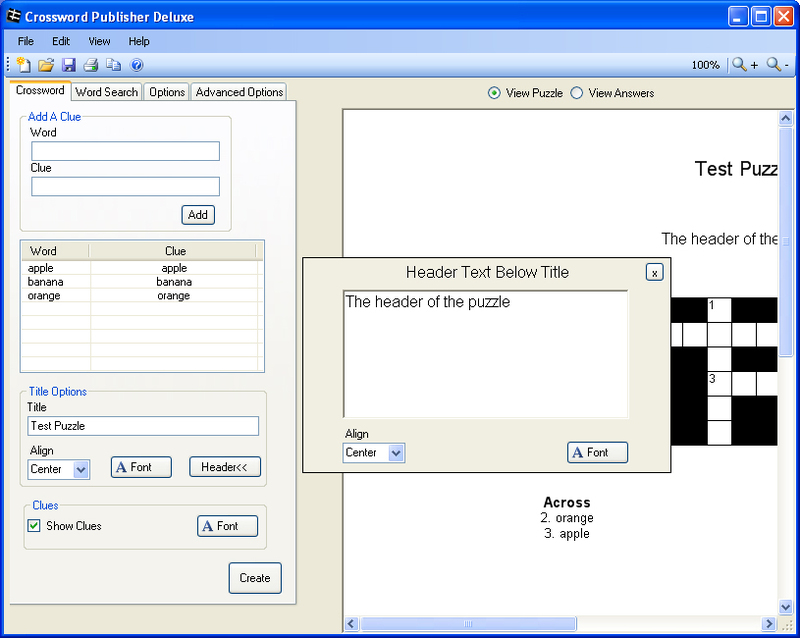 Easily create crossword puzzles for any occasion. Perfect for parties, educators, and puzzle enthusiasts! At less than half the price of similar software, you can’t go wrong!